Kelsey Lalor wasn't thrilled to open the women's baseball World Cup with a 0-for-2 day in Canada's first game of the tournament last week. So the outfielder made some adjustments and shook off some nerves. And she hasn't looked back since. "I didn't start off that well in our first game, but I think when you come into a World Cup you're always a little bit anxious and you're just trying to get that first hit," Lalor said from Viera, Fla., where the biennial event is being held this year. "Once I got that first one things started to get going. "I've kind of settled into a groove now and I'm hoping I can stay nice and smooth at the plate and just stay within myself as a player and do everything I can to get the job done." At 20 years old, Lalor is one of the veterans on Canada's 20-woman team, which features seven players that are 18 or younger. "I feel as though I understand my role on the team and just having that experience, knowing what you're getting into before getting there, it's really helpful in your preparation and your training and the mental side of things," Lalor said. "It makes a big difference when you're prepared for what you're going to see versus when you're going in blindside. "So it's definitely a different feeling coming in to this World Cup now as a veteran on the team. There's more expectations but I'm also ready for what's going to be thrown at me." The Canadians finished the first round of the tournament in second place in Group B with a 4-1 record. Their only loss was a 2-1 defeat against Japan, a team that's won 26 straight World Cup games en route to five consecutive championships. Canada is 2-1 in the super round, where teams carry their records against other second-round squads into the crossover phase of the tournament. They also won't square off against teams they already faced in Round 1. Lalor, who also plays basketball at the University of Saskatchewan where she's completing a kinesiology degree, was instrumental for Canada through most of the first round, including a significant 9-6 win over No. 4 Australia when she went 2-for-5 with an RBI and made an impressive diving catch in left field. The video of the play — Lalor sprinting in and diving to the turf to make the catch — had more than 5,000 views and over 100 likes on the World Baseball and Softball Confederation's Twitter page as of Tuesday morning. She laughed at the notion that she's gained any notoriety from the clip. But she hopes it can help showcase women's baseball on a larger scale. "There have been a ton of highlights — stuff from Japan, the U.S., Australia, the Dominican, Puerto Rico, Canada — big hits and big plays and I think social media can be a very good thing when trying to expose our game," Lalor said. 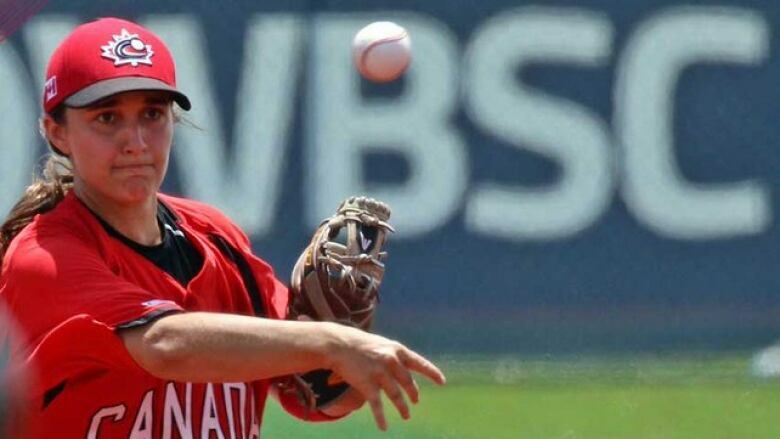 "The WBSC and Baseball Canada have done a very good job, I think, of showing the world what women's baseball is all about. Like, this is what women can do."